Most people know little about the beautiful leaf-shaped island of Taiwan. Approximately 100 miles from mainland China, Taiwan is one of the most politically complicated destinations in the world. Despite its complications, the country is the most underrated tourist destination in Asia. Approximately 280 miles by 60 miles wide, Taiwan is sandwiched between the South China Sea and the Pacific Ocean. One hundred miles to its west is the Chinese province of Fujian. To the northeast lies the Ryukyu chain of islands that comprise present-day Okinawa. Approximately 1,200 miles away is mainland Japan. On Taiwan's southernmost horizon is the first northern island of the Philippine chain. A ridge of glorious mountains runs north-south down the center of the island. The eastern face of Taiwan rises precipitously from the blue Pacific, while the lush western plains drop gradually into the silty China Sea. Taiwan is home to a Chinese-speaking population of 23 million hard-working, hard-playing people. "Made in Taiwan" now denotes some of the highest quality technology products in the world. Approximately 98 percent of Taiwanese citizens today claim descent from Han Chinese immigrants from mainland China. The remaining two percent are made up of the Austronesian indigenous population. Taiwan is an exciting, noisy, modern island of industry and trade with crowded metropolitan areas of millions of inhabitants. It's also a relaxing, tranquil, traditional place of culture and history with misty waterfalls and towering mountain peaks. Few locations so small can boast snow-peaked mountains, bountiful plains, tropical beaches, and magnificent gorges, all within a few hours drive from each other. Taiwan's mountains offer refreshing day hikes close to Taipei, as well as challenging week-long alpine back country excursions. Mountains cover almost half of Taiwan, and the country offers some of the most captivating and diverse scenery anywhere on the planet. So it's hard to understand why Taiwan is not a more popular tourist destination. Culturally it is just as diverse. You will find yourself surrounded by the ancient traditions of the Chinese as you visit temples and festivals or watch the tai chi practitioner's commune with the Tao in the parks. You will also be caught up in the bustle of Taiwan's state-of-the-art department stores, trendy boutiques, sensational cuisine and a fascinating cultural mix. Despite the hustle and bustle, Taiwanese maintain their spiritual traditions. You will frequently see metal bins along the street with locals burning "spirit money" in them as offerings. One of the most endearing things about the island is the overwhelming friendliness of its people. Taiwan is the one of the most welcoming countries in the world, and you are bound to encounter numerous acts of generosity or kindness throughout your travels. Taiwanese will stare at foreigners but will warmly embrace you, so take advantage of their gregarious curiosity about you. Eating in Taiwan is a close second to the people. Eating constitutes a major preoccupation, concern and form of enjoyment in Taiwan. Everyone eats out all the time—breakfast, lunch and dinner. Night markets are the best places to sample local food at budget prices. Some stalls open for lunch, but in general things only really get going after 5pm and start to wind down after 11pm. Traveling around the island is relatively straightforward. Although the lack of English can make things a challenge at times, the willingness of almost everyone you meet to help means it's almost impossible to get stuck. Taipei, the capital, is crowded and busy and considered one of the most densely inhabited cities on earth, with almost 3 million people. Colorful signs with wondrous Chinese characters intensify the confusion of shops, markets, restaurants and food stalls. Cars, buses and people are everywhere and always in motion. Though you could spend months here and still not absorb all that Taipei has to offer, a week is usually enough to get a decent taste. Many tourists come solely to visit the mind-blowing National Palace Museum, but they risk missing out on a host of other attractions. Tour the Presidential Building, National Dr. Sun Yat-sen Memorial Hall and Chiang Kai-shek Memorial Hall to grapple with Taiwan's complex history. Then Longshan and Confucius Temples are the best introduction to its religious and philosophical traditions. And don't miss Taipei 101, the second tallest building in the world. The dangers of the country's roads are apparent from the moment you arrive. Vehicles of all sizes, from giant buses to cars and scooters, all aggressively jockey for position with reckless disregard for road rules. The sheer number of scooters and motorcycles on the roads compounds the danger. There are more than 10 million scooters in Taiwan, giving it the world's largest per-capita ownership level. Perhaps the greatest problem with scooters is the rampant disparity between them and other vehicles. In major cities such as Taipei, rush-hour traffic resembles formations of kamikaze pilots bearing down on the next red light. Mountains run down the center of Taiwan and supply a welcomed contrast to the hubbub of coastal cities. The mountain resort of Alishan is where visitors awaken way before dawn to climb Chushan for the most incredible sunrise in Asia. Hiking in the mountains, or anywhere on the island, is well defined and very popular. Taroko Gorge, one of Taiwan's most noted scenic sights, is 12 miles of steep cliffs and fast running water. The resort town of Tienhsiang is at the head of the gorge, the place to stay to enjoy the serenity. Located on the rugged east coast of Taiwan, the Taroko National Park is one of six national parks on the island. Created by the Liwu River, it features winding gorges, waterfalls, breathtaking views and a variety of hiking trails at different skill levels. The off islands of the Penghu group, between Taiwan and mainland China, have become very popular. Sandy beaches, warm through the summer months, sunny skies and good seafood attract more visitors to the archipelago each year. One of the most popular attractions in Taiwan, Kenting National Park has exceptional natural beauty with golden-sand beaches, palm trees, lush forests and sand dunes. This tropical region makes for an excellent escape from winter in the mountains, and the heat is always eased by a constant, refreshing sea breeze. The area provides good opportunities for recreational activities such as biking and hiking. Due to the volcanic activity there are also numerous hot springs in the area. 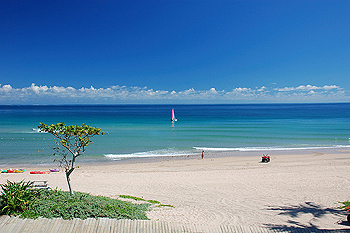 Apart from the lush nature, beaches are one of the major attractions in Kenting. Large resorts control the majority of the beaches, but they are accessible to everyone. Kenting beaches offer good opportunities for surfing, banana boat riding, water skiing, windsurfing, sailing, snorkeling and diving. The area is famous for its beautiful coral reefs and rich marine life. To view the unique underwater life you can take an unforgettable glass-bottom boat tour. You can also make a trip to the peaceful, white-sand Baisha Bay, which is not far from Kenting. As soon as the sun goes down, the bars, clubs and pubs liven up the nights. If you love the outdoors, it will be hard to find a place better suited to indulge your passion than Maolin, in the south-central mountain area. A picture-postcard paradise of winding streams, high-mountain passes and reclusive monasteries high in the hills makes for incredible hikes and treks. In this natural playground you can hike to three of the islands most beautiful waterfalls, swim in natural pools and rivers, cycle the scenic County Rd. 132 (approximately 9 miles one-way), or take a dip in hot springs with the locals. This is ideal country for a quiet break, hiking, biking or bird watching. The South Cross Island Highway runs from Tainan on the West Coast to Taitung on the East Coast. A journey along this highway will take you through a world of contrasts that offers a fascinating portrait of the face of Taiwan. Spectacular mountain scenery and lush green forests alternate with small rural villages and farmlands as the highway winds its way through southern Taiwan. The trip can be completed in a single day by car or bus, or on foot as a 3- or 4-day hike, stopping in villages along the way. Taiwan's best diving tends to be off the islands around the coast. The sites at Green Island to the east include Nanliao, with beautiful coral; Chungliao Submerged Reef (suitable only for advanced divers); and Tapaisha. Orchid Island is surrounded by coral reefs and features several recommended dive sites. The coral reefs of the south and the Pescadores Islands are considered good scuba diving and snorkeling areas. Rivers, lakes and the sea are ideal for swimming. The best time for swimming on the north coast is May to September; the south coast has warm waters all year round and hot springs abound throughout the country. Some of the sites are easily accessible and provide baths, hot tubs and hotel facilities. Lakes, rivers, fish farms and the sea offer mainly unrestricted fishing. Near Taipei, there is good fishing at the Tamsui and Hsintien rivers, Green Lake and Shihmen Reservoir.